Ganges is one 11-year-long restless night. Begun in 2006 and just recently concluded with its sixth issue, Kevin Huizenga's series is one non-sequitur after another, all perfectly linked together by Huizenga's unrelenting inability to quiet his mind and just shut his eyes for a few hours of sleep. Huizenga’s storytelling has always had this abstract element to it, from his fight comics to his comics about nature, but in Ganges it is easy to get lost in it if you’re looking for a straightforward narrative. Trying to map the plot of this series from Point A. through to Point Z. would be madness because our brains, at their rawest and most frayed, don’t work like that. And that’s what Huizenga’s cartoons here are about, those moments in time and space where order isn’t logical because our perceptions aren’t able to handle logic. Huizenga can be a hard cartoonist to pin down. Sometimes his comics are about form and function as he tries to see what ways he can twist and manipulate the printed image but other times, his concerns are much warmer and more compassionate than that, bordering on (if not full-out tilting toward) tell-all autobiography, or at least a facsimile of autobiography. Ganges gives him the room to indulge in all of his interests as his slice-of-life comics frame the narrative gymnastics he performs to you in the same fragile state-of-mind as Glenn Ganges, a man who just can’t fall asleep. 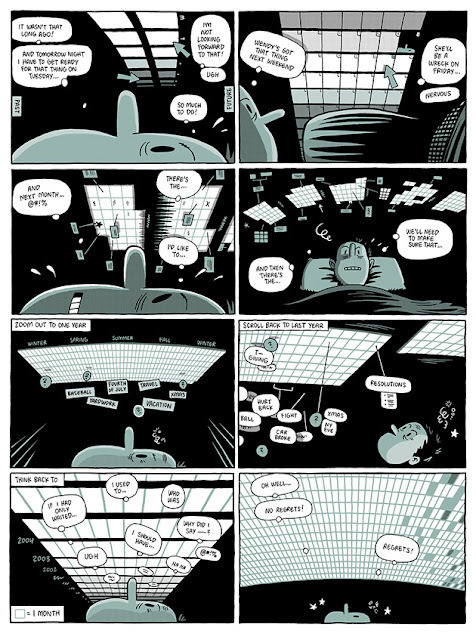 Huizenga balances the mundane and the surreal in these comics, inducing the same helpless feelings in the reader as his character is feeling as he stares at his ceiling trying to figure out how to get some rest. A big oddity of this comic is its 11 year cultivation. Reading an issue every year or two, it may be hard to see the connections that Huizenga is making from issue to issue. Glenn’s inability to sleep may just be caused by the mania of this series. But reading each of the issues together, you can begin to see the cartoonist and the character’s restless mind in action as ideas and concepts bounce off of each other, amplifying or even spotlighting things that you may have missed the first time. Each issue becomes a piece of a puzzle that maybe doesn’t have a solution. From an old co-worker to his sometimes antagonistic relations with his wife (more just frustrated sniping than anything too mean or harsh,) Glenn’s life is full of these moments in time that defines who he’s going to be in the days, months and years to come. In fact, he may already be that man as Huizenga compresses time down into what may be a single day and night. With a free-ranging timeline, there’s little delineation between what’s happening now, what happened years ago or what’s yet to happen. Parts of Ganges are obviously flashbacks but Huizenga doesn't need to create an obvious and clear timeline because that would be too orderly. 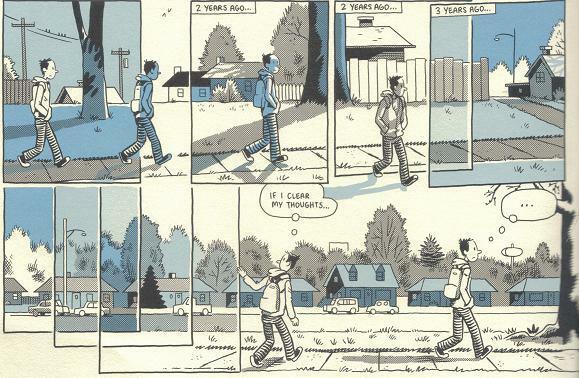 And time doesn't really matter because everything is happening at once in Huizenga's comics. Huizenga’s cartooning manipulates the comic page to bend time and space back upon itself. It’s hard to imagine another artist being able to capture the way your mind races only at 3 a.m. with the creative clarity that he does. It’s not that he gives the thousand racing thoughts any clarity but it’s his depiction of thought and time that creates a universality to the sleepless tossing and turning that everyone experiences at some point. 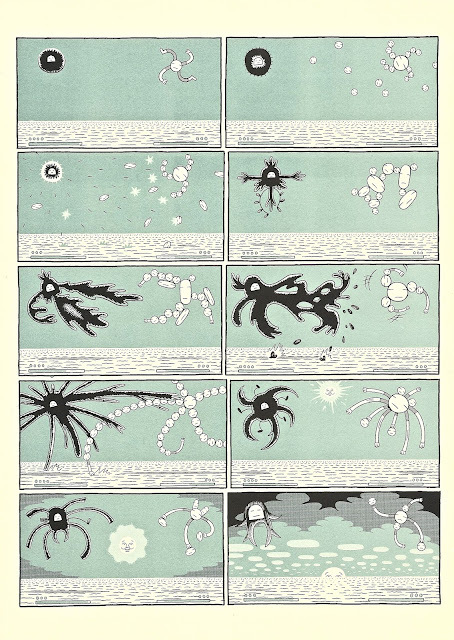 Through all six issues, Huizenga draws images that are surreal but relatable as his storytelling visually mimics the sensation of an overactive mind. As Glenn’s mind sleeplessly races, Huizenga’s ability to visualize his character’s inner thoughts creates pages and pages of pure cartooning. Huizenga uses the comic page as a canvas to tell his stories but the psychedelia of his art warps reality for both the characters and for his readers. Glenn is such an everyman that as he has these visions strange creatures fighting one another or his own self image doubling and tripling up on itself, Huizenga’s abstractions become concrete because we can relate to the character’s experiences of uncertainty as our minds become capable of imagining some incredibly odd things after the lack of rest. The lack of focus in Ganges is actually its focus and its concerns. From the story that Huizenga is telling to the abstract methods he uses to tell that story, Huizenga has no interest in making it any easier for the reader to get through these comics than it is for Glenn to get through this sleepless night. Even in the final issue, Huizenga simply ends the book, enveloping the reader in more mysteries and puzzles, rather than offering a conclusion to Glenn’s trouble. There’s no “and then he fell asleep and lived happily ever after.” Huizenga continues to play with form up to the last page, having pages at the end of the series that continue to even more disconnected from the goal of sleep than anything that has come before them.